"Baktria" redirects here. For the historical region, see Bactria. Approximate maximum extent of the Greco-Bactrian kingdom circa 180 BC, including the regions of Tapuria and Traxiane to the West, Sogdiana and Ferghana to the north, Bactria and Arachosia to the south. Diodotus, the satrap of Bactria (and probably the surrounding provinces) founded the Greco-Bactrian Kingdom when he seceded from the Seleucid Empire around 250 BC and became King Diodotus I of Bactria. The preserved ancient sources (see below) are somewhat contradictory, and the exact date of Bactrian independence has not been settled. Somewhat simplified, there is a high chronology (c. 255 BC) and a low chronology (c. 246 BC) for Diodotos’ secession. The high chronology has the advantage of explaining why the Seleucid king Antiochus II issued very few coins in Bactria, as Diodotos would have become independent there early in Antiochus' reign. On the other hand, the low chronology, from the mid-240s BC, has the advantage of connecting the secession of Diodotus I with the Third Syrian War, a catastrophic conflict for the Seleucid Empire. In 247 BC, the Ptolemaic empire (the Greek rulers of Egypt following the death of Alexander the Great) captured the Seleucid capital, Antioch. In the resulting power vacuum, Andragoras, the Seleucid satrap of Parthia, proclaimed independence from the Seleucids, declaring himself king. A decade later, he was defeated and killed by Arsaces of Parthia, leading to the rise of a Parthian Empire. This cut Bactria off from contact with the Greek world. Overland trade continued at a reduced rate, while sea trade between Greek Egypt and Bactria developed. 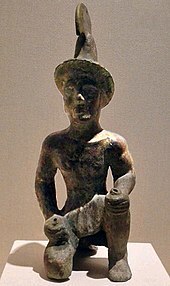 Probable statuette of a Greek soldier, wearing a version of the Greek Phrygian helmet, from a 3rd-century BC burial site north of the Tian Shan, Xinjiang Region Museum, Urumqi. Probable Greek soldier in the Sampul tapestry, woollen wall hanging, 3rd–2nd century BC, Sampul, Urumqi Xinjiang Region Museum. To the north, Euthydemus also ruled Sogdiana and Ferghana, and there are indications that from Alexandria Eschate the Greco-Bactrians may have led expeditions as far as Kashgar and Ürümqi in Xinjiang, leading to the first known contacts between China and the West around 220 BC. The Greek historian Strabo too writes that: "they extended their empire even as far as the Seres (Chinese) and the Phryni". (Strabo, XI.XI.I). Several statuettes and representations of Greek soldiers have been found north of the Tian Shan, on the doorstep to China, and are today on display in the Xinjiang museum at Urumqi (Boardman). Middle Eastern or Greek influences on Chinese art have also been suggested (Hirth, Rostovtzeff). Designs with rosette flowers, geometric lines, and glass inlays, suggestive of Egyptian, Persian, and/or Hellenistic influences, can be found on some early Han dynasty bronze mirrors. Some speculate that Greek influence is found in the artworks of the burial site of China's first Emperor Qin Shi Huang, dating back to the 3rd century BC, including in the manufacture of the famous Terracotta army. This idea suggested that Greek artists may have come to China at that time to train local artisans in making sculptures However, this idea is disputed by Chinese scholars. "When I was in Bactria (Daxia)", Zhang Qian reported, "I saw bamboo canes from Qiong and cloth made in the province of Shu (territories of southwestern China). When I asked the people how they had gotten such articles, they replied, "Our merchants go buy them in the markets of Shendu (India)." (Shiji 123, Sima Qian, trans. Burton Watson). The Son of Heaven on hearing all this reasoned thus: Ferghana (Dayuan) and the possessions of Bactria (Daxia) and Parthia (Anxi) are large countries, full of rare things, with a population living in fixed abodes and given to occupations somewhat identical with those of the Chinese people, and placing great value on the rich produce of China. (Hanshu, Former Han History). The Indian emperor Chandragupta, founder of the Mauryan dynasty, had re-conquered the northwestern subcontinent upon the death of Alexander the Great around 323 BC. However, contacts were kept with his Greek neighbours in the Seleucid Empire, a dynastic alliance or the recognition of intermarriage between Greeks and Indians were established (described as an agreement on Epigamia in Ancient sources), and several Greeks, such as the historian Megasthenes, resided at the Mauryan court. Subsequently, each Mauryan emperor had a Greek ambassador at his court. 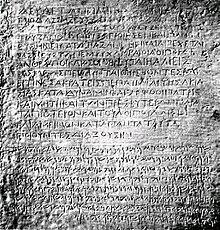 Kandahar Bilingual Rock Inscription of Ashoka (in Greek and Aramaic), found in Kandahar. Circa 250 BC, Kabul Museum. Chandragupta's grandson Ashoka converted to the Buddhist faith and became a great proselytizer in the line of the traditional Pali canon of Theravada Buddhism, directing his efforts towards the Indo-Iranic and the Hellenistic worlds from around 250 BC. According to the Edicts of Ashoka, set in stone, some of them written in Greek, he sent Buddhist emissaries to the Greek lands in Asia and as far as the Mediterranean. The edicts name each of the rulers of the Hellenistic world at the time. 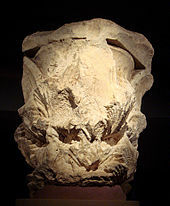 One of the Hellenistic-inspired "flame palmettes" and lotus designs, which may have been transmitted through Ai-Khanoum. Rampurva bull capital, India, circa 250 BC. The Greco-Bactrian city of Ai-Khanoum, being located at the doorstep of India, interacting with the Indian subcontinent, and having a rich Hellenistic culture, was in a unique position to influence Indian culture as well. It is considered that Ai-Khanoum may have been one of the primary actors in transmitting Western artistic influence to India, for example in the creation of the Pillars of Ashoka or the manufacture of the quasi-Ionic Pataliputra capital, all of which were posterior to the establishment of Ai-Khanoum. The scope of adoption goes from designs such as the bead and reel pattern, the central flame palmette design and a variety of other moldings, to the lifelike rendering of animal sculpture and the design and function of the Ionic anta capital in the palace of Pataliputra. Indian coinage of Agathocles, with Buddhist lion and dancing woman holding lotus, possible Indian goddess Lakshmi. One of the last Greco-Bactrian kings, Agathocles of Bactria (ruled 190–180 BC), issued remarkable Indian-standard square coins bearing the first known representations of Indian deities, which have been variously interpreted as Vishnu, Shiva, Vasudeva, Buddha or Balarama. Altogether, six such Indian-standard silver drachmas in the name of Agathocles were discovered at Ai-Khanoum in 1970. These coins seem to be the first known representations of Vedic deities on coins, and they display early Avatars of Vishnu: Balarama-Sankarshana with attributes consisting of the Gada mace and the plow, and Vasudeva-Krishna with the Vishnu attributes of the Shankha (a pear-shaped case or conch) and the Sudarshana Chakra wheel. Some other coins by Agathocles are also thought to represent the Buddhist lion and the Indian goddess Lakshmi, consort of Vishnu. The Indian coinage of Agathocles is few but spectacular. These coins at least demonstrate the readiness of Greek kings to represent deities of foreign origin. The dedication of a Greek envoy to the cult of Garuda at the Heliodorus pillar in Besnagar could also be indicative of some level of religious syncretism. 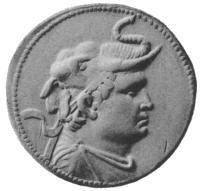 Silver coin depicting Demetrius I of Bactria (reigned c. 200–180 BC), wearing an elephant scalp, symbol of his conquests in northwest Indian subcontinent. Demetrius, the son of Euthydemus, started an invasion of the subcontinent from 180 BC, a few years after the Mauryan empire had been overthrown by the Shunga dynasty. Historians differ on the motivations behind the invasion. Some historians suggest that the invasion of the subcontinent was intended to show their support for the Mauryan empire, and to protect the Buddhist faith from the religious persecutions of the Shungas as alleged by Buddhist scriptures (Tarn). Other historians have argued however that the accounts of these persecutions have been exaggerated (Thapar, Lamotte). Demetrius may have been as far as the imperial capital Pataliputra in today's eastern India (today Patna). However, these campaigns are typically attributed to Menander. The invasion was completed by 175 BC. This established in the northwestern Indian Subcontinent what is called the Indo-Greek Kingdom, which lasted for almost two centuries until around AD 10. The Buddhist faith flourished under the Indo-Greek kings, foremost among them Menander I. It was also a period of great cultural syncretism, exemplified by the development of Greco-Buddhism. Silver tetradrachm of King Eucratides I 171–145 BC. The Greek inscription reads: ΒΑΣΙΛΕΩΣ ΜΕΓΑΛΟΥ ΕΥΚΡΑΤΙΔΟΥ – "(of) King Great Eucratides". Bilingual coin of Eucratides in the Indian standard, on the obverse Greek inscription reads: ΒΑΣΙΛΕΩΣ ΜΕΓΑΛΟΥ ΕΥΚΡΑΤΙΔΟΥ-"(of) King Great Eucratides", Pali in the Kharoshthi script on the reverse. Eucratides campaigned extensively in present-day northwestern India, and ruled a vast territory, as indicated by his minting of coins in many Indian mints, possibly as far as the Jhelum River in Punjab. In the end, however, he was repulsed by the Indo-Greek king Menander I, who managed to create a huge unified territory. Gold 20-stater of Eucratides, the largest gold coin of Antiquity. The coin weighs 169.2 grams, and has a diameter of 58 millimeters. The 5th-century historian Orosius reports that Mithridates I managed to occupy territory between the Indus and the Hydaspes towards the end of his reign (c. 138 BC, before his kingdom was weakened by his death in 136 BC). Heliocles I ended up ruling what territory remained. The defeat, both in the west and the east, may have left Bactria very weakened and open to nomadic invasions. The migrations of the Yuezhi through Central Asia, from around 176 BC to AD 30. In 162BC the Yuezhi were driven west to the Ili River valley by the Xiongnu. In 132 they were driven out of the Ili valley by the Wusun. They fled southwest and two years later took northern Bactria from the Saka who had recently defeated the Greco-Bactrians. Gold artefacts of the Scythians in Bactria, at the site of Tillia tepe. Around 140 BC, eastern Scythians (the Saka, or Sacaraucae of Greek sources), apparently being pushed forward by the southward migration of the Yuezhi started to invade various parts of Parthia and Bactria. Their invasion of Parthia is well documented: they attacked in the direction of the cities of Merv, Hecatompolis and Ecbatana. They managed to defeat and kill the Parthian king Phraates II, son of Mithridates I, routing the Greek mercenary troops under his command (troops he had acquired during his victory over Antiochus VII). Again in 123 BC, Phraates's successor, his uncle Artabanus I, was killed by the Scythians. When the Han Chinese diplomat Zhang Qian visited the Yuezhi in 126 BC, trying to obtain their alliance to fight the Xiongnu, he explained that the Yuezhi were settled north of the Oxus but also held under their sway the territory south of Oxus, which makes up the remainder of Bactria. The Yuezhi further expanded southward into Bactria around 120 BC, apparently further pushed out by invasions from the northern Wusun. It seems they also pushed Scythian tribes before them, which continued to India, where they came to be identified as Indo-Scythians. Silver coin of Heliocles (r. 150–125 BC), the last Greco-Bactrian king. The Greek inscription reads: ΒΑΣΙΛΕΩΣ ΔΙΚΑΙΟΥ ΗΛΙΟΚΛΕΟΥΣ – "(of) King Heliocles the Just". The best known tribes are those who deprived the Greeks of Bactriana, the Asii, Pasiani, Tochari, and Sacarauli, who came from the country on the other side of the Jaxartes, opposite the Sacae and Sogdiani. Around that time the king Heliocles abandoned Bactria and moved his capital to the Kabul valley, from where he ruled his Indian holdings. Having left the Bactrian territory, he is technically the last Greco-Bactrian king, although several of his descendants, moving beyond the Hindu Kush, would form the western part of the Indo-Greek kingdom. The last of these "western" Indo-Greek kings, Hermaeus, would rule until around 70 BC, when the Yuezhi again invaded his territory in the Paropamisadae (while the "eastern" Indo-Greek kings would continue to rule until around AD 10 in the area of the Punjab region). 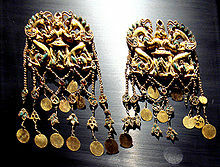 Overall, the Yuezhi remained in Bactria for more than a century. They became Hellenized to some degree, as suggested by their adoption of the Greek alphabet to write their Iranian language, and by numerous remaining coins, minted in the style of the Greco-Bactrian kings, with the text in Greek. Around 12 BC the Yuezhi then moved further to northern India where they established the Kushan Empire. Indian War Elephant with wooden tower. Before the arrival of the Greek settlers, the armies of Bactria were overwhelmingly composed of cavalry and were well known as effective soldiers, making up large portions of the Achaemenid cavalry contingents. 2,000 Bactrian horsemen fought at the Granicus against Alexander and 9,000 at the Battle of Gaugamela on the left flank of Darius' army. Herodotus also mentions the widespread use of chariots among the Bactrians. After Alexander's conquest of Bactria, Bactrian cavalry units served in his army during the invasion of India and after the Indian campaign, Alexander enlarged his elite companion cavalry by adding Bactrians, Sogdians and other east Iranian cavalrymen. Both Aeschylus (The Persians, v. 318) and Curtius mention that Bactria was able to field a force of 30,000 horse. Most of these horsemen were lightly armed, using bows and javelins before closing with sword and spear. Herodotus describes the Persian cavalry of Mardonius at the Battle of Plataea (which included Bactrians) as horse archers (hippotoxotai). Bactrian infantry is described by Herodotus as wearing caps in the Median style, short spears and reed Scythian style bows. Alexander and Seleucus I both settled Greeks in Bactria, while preferring to keep their Macedonian settlers farther west. Greek garrisons in the satrapy of Bactria were housed in fortresses called phrouria and at major cities. Military colonists were settled in the countryside and were each given an allotment of land called a kleros. These colonists numbered in the tens of thousands, and were trained in the fashion of the Macedonian army. A Greek army in Bactria during the anti-Macedonian revolt of 323 numbered 23,000. The army of the Greco-Bactrian kingdom was then a multi-ethnic force with Greek colonists making up large portions of the infantry as pike phalanxes, supported by light infantry units of local Bactrians and mercenary javelin-wielding Thureophoroi. The cavalry arm was very large for a Hellenistic army and composed mostly of native Bactrian, Sogdian and other Indo-Iranian light horsemen. Polybius mentions 10,000 horse at the Battle of the Arius river in 208 BC. Greco-Bactrian armies also included units of heavily armored cataphracts and small elite units of companion cavalry. The third arm of the Greco-Bactrian army was the Indian war elephants, which are depicted in some coins with a tower (thorakion) or howdah housing men armed with bows and javelins. This force grew as the Greco-Bactrian kingdom expanded into India and was widely depicted in Greco-Bactrian coinage. Other units in the Bactrian military included mercenaries or levies from various surrounding peoples such as the Scythians, Dahae, Indians and Parthians. The Greco-Bactrians were known for their high level of Hellenistic sophistication, and kept regular contact with both the Mediterranean and neighbouring India. They were on friendly terms with India and exchanged ambassadors. Their cities, such as Ai-Khanoum in northeastern Afghanistan (probably Alexandria on the Oxus), and Bactra (modern Balkh) where Hellenistic remains have been found, demonstrate a sophisticated Hellenistic urban culture. This site gives a snapshot of Greco-Bactrian culture around 145 BC, as the city was burnt to the ground around that date during nomadic invasions and never re-settled. Ai-Khanoum "has all the hallmarks of a Hellenistic city, with a Greek theater, gymnasium and some Greek houses with colonnaded courtyards" (Boardman). 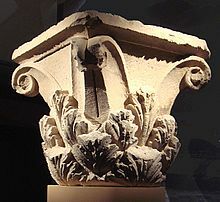 Remains of Classical Corinthian columns were found in excavations of the site, as well as various sculptural fragments. In particular a huge foot fragment in excellent Hellenistic style was recovered, which is estimated to have belonged to a 5–6 meters tall statue. Stone block with the inscriptions of Kineas in Greek. Ai Khanoum. Some of the Greco-Bactrian coins, and those of their successors the Indo-Greeks, are considered the finest examples of Greek numismatic art with "a nice blend of realism and idealization", including the largest coins to be minted in the Hellenistic world: the largest gold coin was minted by Eucratides (reigned 171–145 BC), the largest silver coin by the Indo-Greek king Amyntas Nikator (reigned c. 95–90 BC). The portraits "show a degree of individuality never matched by the often bland depictions of their royal contemporaries further West" (Roger Ling, "Greece and the Hellenistic World"). Several other Greco-Bactrian cities have been further identified, as in Saksanokhur in southern Tajikistan (archaeological searches by a Soviet team under B.A. Litvinski), or in Dal'verzin Tepe. Bronze Herakles statuette. Ai Khanoum. 2nd century BC. Sculpture of an old man, possibly a philosopher. Ai Khanoum, 2nd century BC. Frieze of a naked man wearing a chlamys. Ai Khanoum, 2nd century BC. Gargoyle in the form of a Greek comic mask. Ai Khanoum, 2nd century BC. Plate depicting Cybele pulled by lions. Ai Khanoum. The existence of a third Diodotid king, Antiochus Nikator, perhaps a younger son of Diodotus I, has recently been suggested. Many of the dates, territories, and relationships between Greco-Bactrian kings are tentative and essentially based on numismatic analysis and a few Classical sources. The following list of kings, dates and territories after the reign of Demetrius is derived from the latest and most extensive analysis on the subject, by Osmund Bopearachchi ("Monnaies Gréco-Bactriennes et Indo-Grecques, Catalogue Raisonné", 1991). The descendants of the Greco-Bactrian king Euthydemus invaded northern India around 190 BC. Their dynasty was probably thrown out of Bactria after 170 BC by the new king Eucratides, but remained in the Indian domains of the empire at least until the 150s BC. Silver coin of Antimachus I. The Greek inscription reads: ΒΑΣΙΛΕΩΣ ΘΕΟΥ ΑΝΤΙΜΑΧΟΥ – "(of) King God Antimachus". Pantaleon (190s or 180s BC) Possibly another brother and co-ruler of Demetrius I.
Apollodotus I (reigned c. 180–160 BC) A fourth brother? Followed by Indo-Greek kings in northern India. Silver tetradrachm of King Eucratides 171–145 BC. The Greek inscription reads: ΒΑΣΙΛΕΩΣ ΜΕΓΑΛΟΥ ΕΥΚΡΑΤΙΔΟΥ – "(of) King Great Eucratides". Heliocles (r. c. 145–130 BC). Heliocles, the last Greek king of Bactria, was invaded by the nomadic tribes of the Yuezhi from the North. Descendants of Eucratides may have ruled on in the Indo-Greek kingdom. Silver drachm of Menander I, dated circa 160-145 BC. Obverse: ΒΑΣΙΛΕΩΣ ΣΩΤΗΡΟΣ ΜΕΝΑΝΔΡΟΥ ('of King Menander the Saviour'), heroic bust of Menander, viewed from behind, head turned to left; Reverse: Athena standing right, brandishing thunderbolt and holding aegis, Karosthi legend around, monogram in field to left. Reference: Sear 7604. ^ possibly present day Qarshi; Encyclopaedia Metropolitana: Or Universal Dictionary of Knowledge, Volume 23, edited by Edward Smedley, Hugh James Rose, Henry John Rose, 1923, page 260, states: "Eucratidia, named from its ruler, (Strabo, xi. p. 516.) was, according to Ptolemy, 2° North and 1° West of Bactra." As these coordinates are relative to, and close to, Bactra, it is reasonable to disregard the imprecision in Ptolemy's coordinates and accept them without adjustment. If the coordinates for Bactra are taken to be 36°45′N 66°55′E﻿ / ﻿36.750°N 66.917°E﻿ / 36.750; 66.917, then the coordinates 38°45′N 65°55′E﻿ / ﻿38.750°N 65.917°E﻿ / 38.750; 65.917 can be seen to be close to the modern day city of Qarshi. ^ EUTHYDEMUS – Encyclopaedia Iranica. ^ Notice of the British Museum on the Zhou vase (2005, attached image): "Red earthenware bowl, decorated with a slip and inlaid with glass paste. Eastern Zhou period, 4th–3rd century BC. This bowl may have intended to copy a possibly foreign vessel in bronze or even silver. Glass has been both imported from the Near East and produced domestically by the Zhou States since the 5th century BC." ^ "The things which China received from the Graeco-Iranian world-the pomegranate and other "Chang-Kien" plants, the heavy equipment of the cataphract, the traces of Greeks influence on Han art (such as) the famous white bronze mirror of the Han period with Graeco-Bactrian designs (...) in the Victoria and Albert Museum" (Tarn, The Greeks in Bactria and India, pp. 363-364). Its popularity at the end of the Eastern Zhou period may have been due to foreign influence." ^ "Why China's Terracotta Warriors Are Stirring Controversy". ^ Copper-Nickel coinage in Greco-Bactria. ^ Ancient Chinese weapons A halberd of copper-nickel alloy, from the Warring States Period. ^ Mentioned in "Hellenism in ancient India", Banerjee, p140, to be taken carefully since Orosius is often rather unreliable in his accounts. ^ Nikonorov, Valerii; The Armies of Bactria 700 B.C. - 450 A.D, page 39. Watson, Burton, trans. (1993). Records of the Great Historian. Han dynasty II, by Sima Qian. Columbia University Press. ISBN 0-231-08167-7. 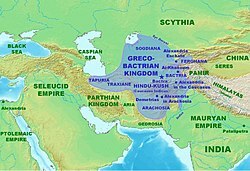 Wikimedia Commons has media related to Greco-Bactrian Kingdom.